A new medical and everyday survival kit has been created that incorporates 70 items inside to cover all major emergencies. 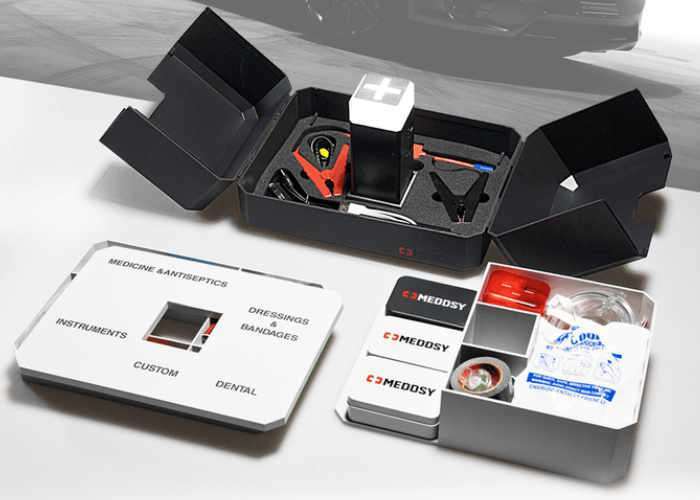 The Meddsy has been designed by travellers, doctors, soldiers, rescue and survival experts and even includes a power core that can jump start a car. Watch the demonstration video below to learn more about the unique design of the Meddsy case and power core, as well as an overview of all the medication, tools and first aid and survival kit accessories which are included. When it comes to survival gear, first aid kits are one of the most overlooked preparedness items out there. We know, they aren’t as fun to talk about as survival knives, bug out bags, and firearms; but when it comes to practical emergency preparedness items, the reality of the situation is that your medical kit is probably going to get more use that any other items in your survival stash. Ibuprofen tablets, extra-strength non-aspirin tablets, aspirin tablets, insect sting relief pads, antibiotic ointment packs, alcohol cleaning pads, bzk antiseptic towelettes, antiseptic treatment application, first aid cream packs, burn relief pack, plastic bandages, fabric bandages, patch bandages, instant cold compress, emergency blanket, moleskin squares, butterfly wound closures, finger splints, first aid tape rolls, trauma pad, sterile eye pad, gauze dressing pads, roller gauze, adhesive tape, thermometer (one time use), nitrile gloves, scissors, tweezers, cotton-tipped applicators, durable clear-pocket softpack. Digital thermometer, water filter travel straw, dental instant pain relief and temporarily repairs lost fillings kits, elastic kinesiology therapeutic tape, splint, cold and flu medicines, intestinal absorbent, colitis and diarrhea/intestinal infection treatment, allergy relief tablets, acid reducer tablets, advanced clotting sponge, respiratory stimulant, syringes, sewing kit, particulate respirator, safety eyewear, survival water bags, quick release tourniquet, hand and toes warmers, acupressure wrist bandage, CPR mask, duct tape, pathogenic microorganisms fighter, condoms.